6 Radios, 6 Speaker Mics, 1 Bank Charger! Golf courses and country clubs have many different needs for two way radios, from communication in the pro shop to work that needs to be done out on the course. 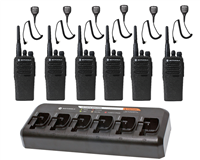 Whether you are a cart boy, food driver, maintenance man, or golf pro, two way radio walkie talkies will improve your efficiency and organization. Keeping the greens and course in top shape and helping customers quickly when needs arise will help you retain and grow business, and two way radios are ready to aid in that goal. Motorola offers the best two way radios for golf course communication. The Motorola CP200d is the most popular two way radio in the world for good reason - it offers fantastic range, great battery life, unmatched speaker quality, and has an industry-leading 3-year warranty. The Motorola RDU4100 is also a great choice and is perfect for cart boys, maintenance, and other general communication needs. This two way radio has 4-watts of power, 10 channels, and an 18.5-hour battery life. For superintendents, the Motorola VX-459-G7 UNI is able to remotely activate your irrigation system, including Toro, Rainbird, and more! This radio not only controls irrigation, it also communicates with your other two way radios and is waterproof for up to 3 feet and 30 minutes. The VX-459 is available with a 9.5-hour or a 15.5-hour battery.